In natural systems, active fluids composed by self-propelling units showed the emergence of dynamic patterns across different length scales, from animal groups to vibrated grains, microtubules, bacteria and chemical or field driven colloids. In a study published in PNAS, researchers from the UBICS and IN2UB institutes show that using a small amount of apolar dopants and growing experimental and simulation activities it’s possible realizing solid and stable structures from passive elements. 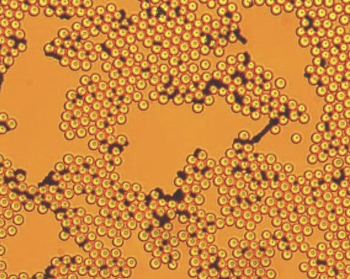 Collections of active particles such as shaken grains, microrobots, driven colloids or bacteria showed exciting collective phenomena such as flocking, i.e. the system tendency to form temporal state of aggregation. However, the presence of self-propulsion in such systems makes difficult to assemble them into stable structures. Here UB researchers solve this timely issue by introducing the concept of "active doping", and show that few light-activated apolar, i.e. non self-propelling, units can be used to rapidly trigger the formation of solid clusters and gels composed by passive colloidal units. This active doping can be used to assemble disparate microscopic objects including synthetic or biological ones, paving the way towards the extension of fundamental concepts of gel formation and glassines to out of equilibrium systems.